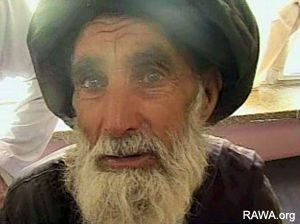 Oct.27, 2006: Sardar Mohammad, from Panjwaye village is hospitalized in a local hospital in Kandahar with his 3 grand children cries and says to journalists: "we are not Taliban, I've never used a gun in my whole life". One of his grand sons who is wounded. 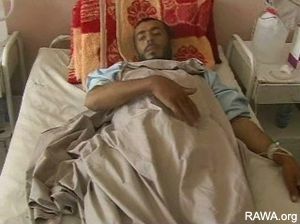 Oct.28, 2006: Ghulam Shaki, 20, from Panjwaye village is hospitalized in a hospital in Kandahar. AFP, KABUL: Fourteen civilians were killed in a bomb blast in southern Afghanistan yesterday as the government said it believed around 25 were killed in fighting between NATO and Taliban three days ago. The UN meanwhile expressed concern about the rising civilian death toll in Afghanistan, where around 40,000 NATO troops and thousands more Afghan troops are fighting a virulent insurgency led by the extremist Taliban. The 14 -- mostly elderly people and children -- were travelling in a minibus that was struck by a bomb in the southern Uruzgan Province, a provincial government official said. The bus was hit just outside the provincial capital Tirin Kot, spokesman Abdul Qayom Qayom said. "Fourteen civilians, mostly elders and children, were killed in the blast and three were wounded," he said. The blast was caused by a mine that had been planted in the road, interior ministry spokesman Zemarai Bashary told reporters. It was unclear who was behind the attack, he said. Officials were also trying to establish how many civilians were killed in clashes between NATO's International Security Assistance Force (ISAF) and Taliban insurgents in Kandahar Province. The interior ministry in Kabul said around 60 people were killed in the battles late on Tuesday, and more than half were insurgents. Bashary said later about 25 of the dead appeared to have been civilians, according to preliminary investigations. An ISAF spokesman in Kandahar said it could confirm 12 civilians were killed in the skirmishes, which included a bombing raid. ISAF has already said it killed 48 insurgents. 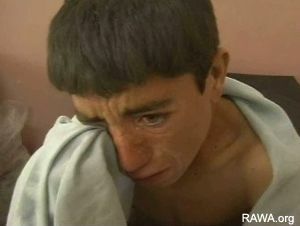 ISAF has already said it deeply regretted any civilian deaths in the encounters on Tuesday, the first of which was sparked when up to 40 men attacked a military base in the Panjwayi district. The area -- about 35km west of Kandahar city -- was the focus of Operation Medusa, a major anti-Taliban action last month. A government-appointed commission found this month that 53 civilians were killed during Operation Medusa, even though ISAF and government officials urged civilians to leave the area before the operation began. The UN mission in Afghanistan said late on Thursday it was concerned about reports of new civilian deaths. "The United Nations has always made clear that the safety and welfare of civilians must always come first and any civilian casualties are unacceptable, without exception," it said in a statement.